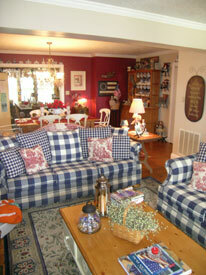 Adjacent to the Blue Ridge Parkway between Milepost 194 & 195, and convenient to Interstates 77 & 81. 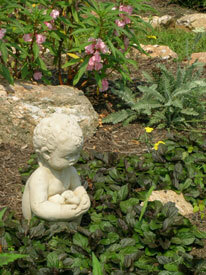 The Inn was designed and built in the style of a traditional Colonial Virginia Inn. From the upper and lower porches you can relax in a rocking chair, and enjoy the refreshing mountain air and countryside views as well as the peace and quiet of the Blue Ridge area. 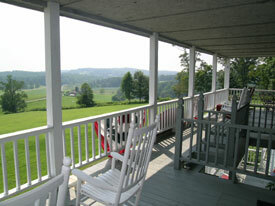 The views from the front porches are absolutely incredible! You will never forget the pleasure you'll have from just sitting and enjoying the company of your loved one--or even the fun of quietly rocking while reading a good book! 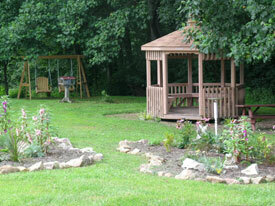 The Inn at Orchard Gap has beautiful landscaping, the perfect backdrop for your wedding or other large outdoor party! A lovely arbor compliments the grounds, making this an elegant spot to hold a candlelit evening ceremony on a warm Blue Ridge Summer night! 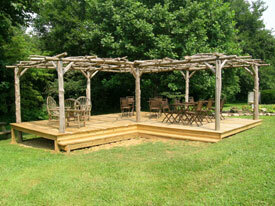 Our gazebo makes a cozy little spot to relax with your mate. The common rooms feature a quaint Americana theme! Two dining tables, comfortable couches, tv and movies...all things to enjoy during the hearty breakfast--or at any time!